When I’m driving in my car and singing along with the radio, I’m often shocked at how I am note for note and tune for tune with the singing ability of Adele. I mean really, my singing is amazing. Sometimes I wonder why someone hasn’t just thrown a Grammy at me. OK, I just snorted from laughing so hard. That may be the biggest lie I have ever told; I can’t carry a tune in a bucket. Apparently when they were handing out talented vocal cords, I was standing in the sarcasm line. Never one to be deterred from a lack of talent, I belt out tunes all day long, much to the chagrin of my kids. Mimi usually tells me “Shhhhhh, no,” but the older and more verbal kid says “Mommy, stop. Your singing hurts my ears.” My bad singing isn’t what embarrasses me (although it should), it’s the fact that I am so crazy I can’t sing them to sleep without crying. I am probably traumatizing the kids and will need to pay for their sleep therapy bills someday because I have special songs I sing to each kid, and I can’t get through the first verse without weeping. Even if the kids have been really bad, my nerves are shot, and I am moments away from selling them on Craigslist, the minute I start singing “their” songs—it’s a waterfall and I am weeping uncontrollably. Should I just pick different songs to sing to them? Probably, but, like I said, I am crazy. I even create little scenarios in my head when I sing to them. Sometimes I imagine dancing with my grown children cheek to cheek at their weddings. Of course there are details like I am looking gorgeous in my dress, my kids have never been happier, and the crowd keeps remarking I look the same as on my wedding day and that having such an amazing waistline at my age should be a crime. If you’re crazy and you know it, clap your hands! For your listening pleasure, here are some slow jams—or the songs I sing to my kids. For Monkey, Bruno Mars’ Count on Me–please note, I burst into tears while searching for it on YouTube. And for Mimi it’s my singing soul mate Adele’s Make You Feel My Love. It’s too much for me. I am going to start the ugly cry. Great songs, right? Did you cry when you were listening to them? Don’t lie, you did. Just when I was coming to terms with my nighttime crying spells, I caught someone else in this house getting emotional when signing a few tunes to the kids. It would seem that Hubby has my kind of crazy. When Hubby dances and sings with Mimi to The Lumineers “Ho Hey,” his eyes get all glassy as he sways his little lady back and forth. She squeals when he sings (why don’t I get that reaction?). I’m pretty sure the line “I don’t think you’re right for him” is his secret prayer that Mimi will always think he is the most wonderful man in the world and never, ever leave him. Maybe he is just singing to his kids, but I like to think his delusions and crazy run deep like mine. After all, I shouldn’t be the only one to screw up these kids, right? 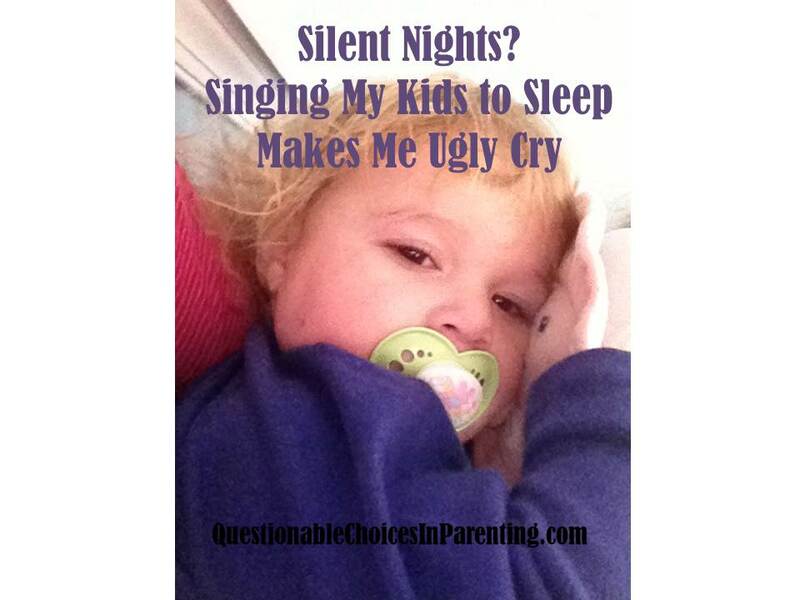 Share the songs you sing with your kids and we can cry together! I also have a giveaway for my readers in Uniontown, PA and Morgantown, WV! The super talent Melissa Rosic is generously giving one lucky reader a Family Portrait session! There are so many things I love about this post I don’t know where to start. Funny, real, and honest. Plus it takes a strong person to admit to liking John Denver (I do too. There, I said it.) Goodnight, My Angel by Billy Joel is the one I always sang to my kids. They are older, so don’t ask me to sing as much any more, but one night I heard a very familiar song coming from my oldest daughter’s room after lights out… She had downloaded Goodnight My Angel onto her iPod and was listening to it as she fell asleep. Ugly cry. Oh my! I am ugly crying right now too! LOVE that song. Thanks so much for sharing! I sing to my kids all of time. I did cry listening to your songs with Evan on the couch. Especially country roads because I can’t wait to take the boys to their first wvu football game. Another crier just like me! Yes! We can’t wait to take the kids to a football game, but for right now, those games are for Mommy and Daddy! Thanks for commenting! Definitely cried reading this. Definitely. I pictured Zach dancing with Ella (which he does nightly) and my heart just exploded. Do you think that attractive brother of yours would resuscitate a girl? I’m sorry–very inappropriate. I’m drunk? Well pass the booze, sista! My son often doesn’t like when I sing. He says “no singing, mama!” But at night I do sing a few songs to him, and he is OK with this. I always thought I could sing, but now I think I probably can’t. My 2 year old wouldn’t lie to me, would he? If he enjoyed my singing, he wouldn’t be begging me to stop? and a few Russian songs. Yes!, The Beatles are always a go-to in this house too. I agree, they may say they don’t want us to sing, but they really love it, dammit! Your posts get better and better! Keep it up! Thanks! I will swing by! Thanks, Vicky! Your comments always make me smile!